Over the years we have hosted a series of powerful events helping business owners tackle many difficult topics such as fundraising, networking, negotiating and many many more. Browse our previous events and even get in touch with us to suggest an event you’d like to see us host in the future. 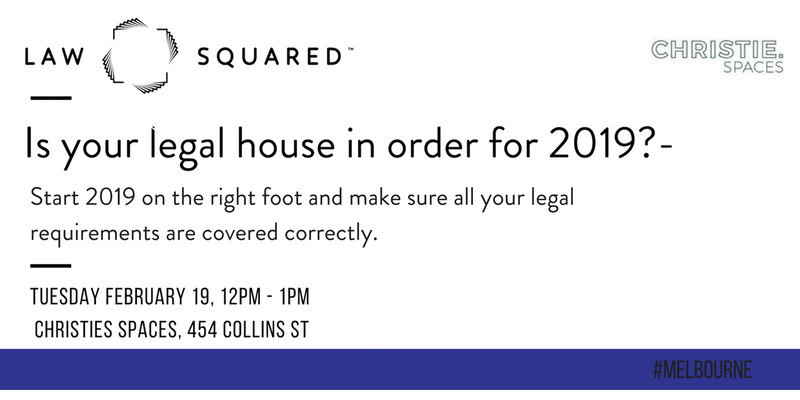 Is your Legal House in order for 2019? We are one month into the year and its time to get the legal and risk parts of your business in check and in order as we roll into 2019! There were a number of changes in various legislation’s particularly in the employment law space which impact businesses moving into 2019! This FREE workshop at Christie's Spaces will help you start 2019 on the right foot. FLAGSHIP EVENT - Social Entrepreneurship - Can a business solve a social problem? There were a number of changes in various legislations particularly in the employment law space which impact businesses moving into 2019! This FREE workshop at Inspire9 will help you start 2019 on the right foot. Maybe you’re asking for a raise, getting buy-in for a new idea or project, closing a deal or navigating a conflict. No matter the situation negotiation skills are key to these interactions. When it comes to business many people shy away from negotiating and struggle to ask for what they want. But as a founder your ability to negotiate could be the difference between a successful and an unsuccessful outcome. When it comes to business situations, many people shy away from negotiating and struggle to ask for what they want. But as a founder, your ability to take a stance and clearly articulate your position could be the difference between achieving a successful or an unsuccessful outcome. If want to learn how to hone your negotiation skills, but have no idea where to start — this workshop is for you. How has technology changed the way in which we shop? Has the internet killed the retail store? Make sure to register below to ensure your spot today. In this series of workshops, Law Squared and Wendy Brooks and Partners will share their expertise in the not-for-profit sector. This final workshop in the 3-part series will guide you through Digital Marketing for NFPs. This event will explore the different sides to raising capital by looking at the pros and cons and what would suit you and your business. This workshop, the second in the 3 part series will guide you through the Disability Sector. The GDPR – what is it and how does it affect your business? If your business collects and stores data then you need to be aware of the GDPR regulations and how it affects Australian businesses. Come along to this fast-paced workshop as Jeremy takes you through the basic business needs to become GDPR compliant. Whether in business or social situations, negotiation is a key part of everyday life. If you want to learn how to hone your negotiation skills, but have no idea where to start — this workshop is for you. Come along to this fast-paced workshop as Jeremy takes you through his top negotiation tips. Watch out bagels here we come! This jam-packed and informative session covers all you need to know about Australia's business relationship with Asia and how you can leverage your international business to successfully launch into Asia. Whether in business or social situations, negotiation is a key part of everyday life. If you want to learn how to hone your negotiation skills, but have no idea where to start this workshop is for you. This event brought together an expert panel of Entrepreneurs who shared their experiences on the unique challenges Entrepreneurs face regarding their mental health and staying well. Tickets are limited so register now - Monday 13 August, 5.30pm at River City Labs, Brunswick Street, Fortitude Valley. Tickets are limited so register now - Wednesday 08 August, 5.30pm at We Work, 401 Collins Street, Melbourne. Raising Capital vs Bootstrapping: Funding 101 for Startups. In this session we will consider a prospective business plan to identify the goals of your business. We will then examine ways in which you may explore gaining funds or other forms of capital to help your business grow. 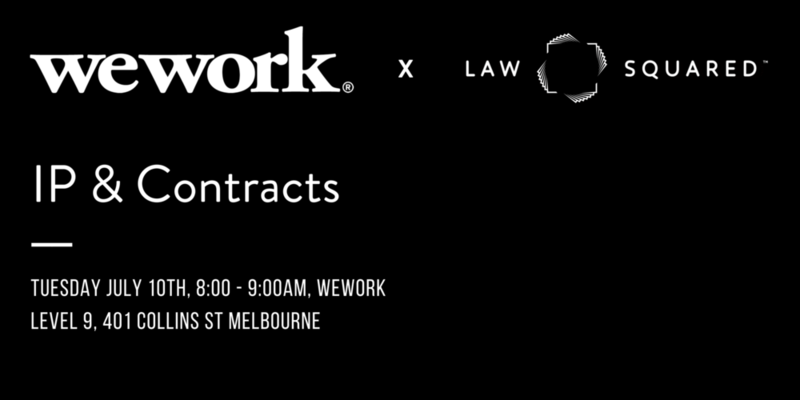 This is event is our final WeWork event in this series hosted by Law Squared. Register now for this event on Tuesday 24 July, 8:00-9:00 at We Work, Level 9, 401 Collins Street, Melbourne. Join the Law Squared team WeWork for an informative lunch time discussion. In this session we will explore agreements that can be made to manage the relationship between you and your employees. We will examine which laws need to be considered, and also avenues in which the business’ interests can be protected through a well-drafted agreement. Register now for this event on Tuesday 17 July, 12:00-1:00 at We Work, Level 9, 401 Collins Street, Melbourne. Join the Law Squared team WeWork for an informative breakfast time discussion. In this session we will examine which contracts are suitable for your business - from agreements with suppliers to employment contracts. We will also explore your rights and responsibilities with respect to Intellectual Property. Register now for this event on Tuesday 10 July, 08:00-09:00 at We Work, Level 9, 401 Collins Street, Melbourne. Shareholders, Directors & Equity - What are they and how do they apply to startups? 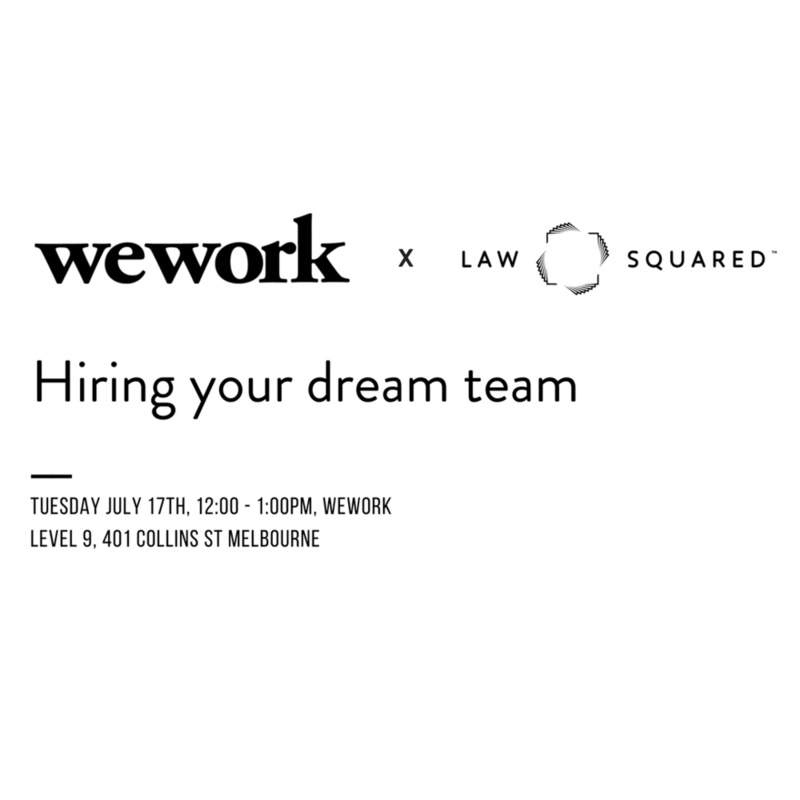 Join the Law Squared team WeWork for an informative lunch time discussion. This session will guide you through the nitty-gritty of starting a business with others. Exploring the common pittfalls that founders face, including how to avoid these. This is the first of five part WeWork x Law Squared Series. Register now for this event on Tuesday 03 July, 12:00-1:00 at We Work, Level 9, 401 Collins Street, Melbourne. Data Privacy and the GDPR - what does it mean for Australian Business? Join data privacy experts from RSM Australia and Law Squared to discuss the impact of the introduction of the General Data Protection Regulation (GDPR). 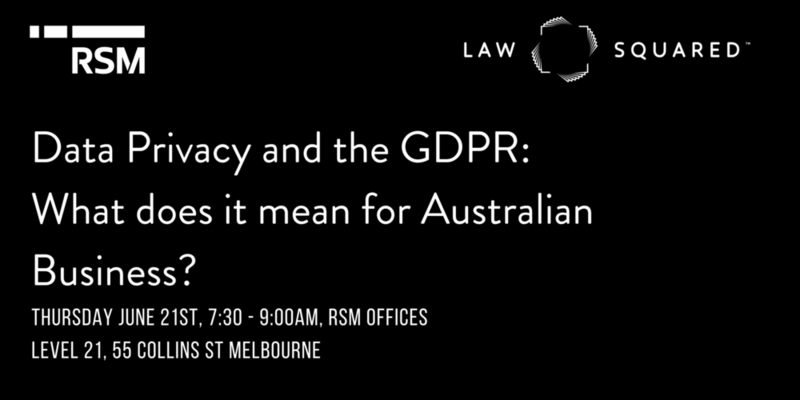 Together, RSM and Law Squared will discuss the impact on business globally during the first three weeks of the introduction of the GDPR regulations and how it effects Australian Business. Register now for this event on Thursday June 21st 7:30-9:00am at Level 21, 55 Collins Street, Melbourne. Your business’ legal position could be the difference between success and failure. Hear from our founder Demetrio Zema and walk away with a strong focus on building and supporting a community of entrepreneurs and startups. Join us on Wednesday June 6th, 6-7:30pm at General Assembly Melbourne. Registration essential, limited seats available! Design and law do not typically meet, but we think they are perfect for each other. Be part of a discussion around how service design and technology can push governments, policy makers, lawyers and institutions to rethink systems. Join us to hear our ideas on how design can be used to transform the justice system. Coffee and a light breakfast will be provided. Join us on Wednesday May 16th from 8:30-10:00am at River City Labs Brisbane. Registration essential, limited seats available! Come and enjoy a lunch and learn with Jess Ruhfus, founder of Collabosaurus, and Demetrio Zema, founder of Law Squared as they navigate you through the fundamental principles of digital marketing and advertising. Learn the do’s and don’ts of digital advertising from a marketing opportunity perspective, as well as the importance of protecting your digital assets (incl. trademarks), understanding your copyright-rights and learning how to avoid any infringement pitfalls. We will also explore online competitions specifically, and what you need to think about to avoid legal issues and make your competition a success. Join us on Tuesday 13 March 12:30-2:00pm at CUB Private Business Club. Registration essential, limited seats available! Women are the largest disruptive economic force on the planet; proven to hold the majority of purchasing power and using their influence to create a ripple-effect of financial and social progress, not just for themselves but for everyone around them. This IWD, we’re taking the discussion beyond the question of gender inequality, however. Instead, this event is looking to the future of leadership, business and societal impact. It's #PressForProgress with a twist; highlighting the inspiring stories, innovative solutions and delving into questions that will help take us all forward. Join us on Thursday 8 March 6:00-8:00pm at WeWork Melbourne. Registration essential, limited seats available! Are you a startup founder or entrepreneur with a unique idea, looking for funding options to launch or scale your venture? 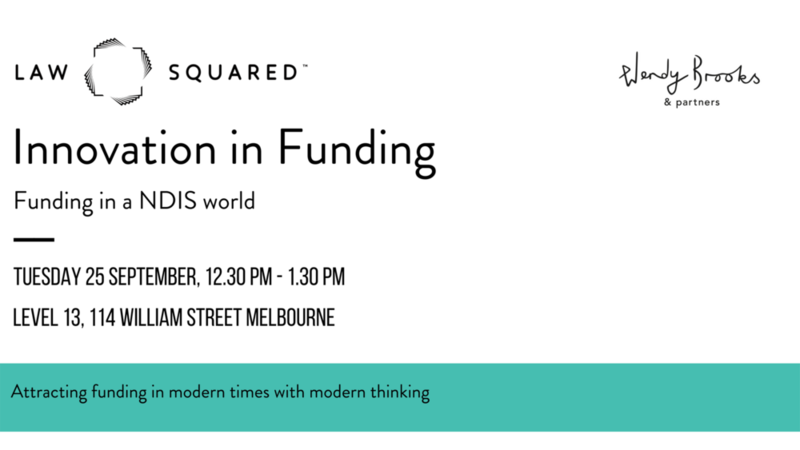 If you’re weighing up whether to raise capital or bootstrap your startup, this event will give you the low-down on each option through the stories and insights of our expert panellists — some of Australia’s brightest startup founders and VCs. Join us on Wednesday 6 December 6:30-8:30pm at One Roof Melbourne. Registration essential, limited seats available! Sign up to our mailing list so we can keep you updated on future sessions!